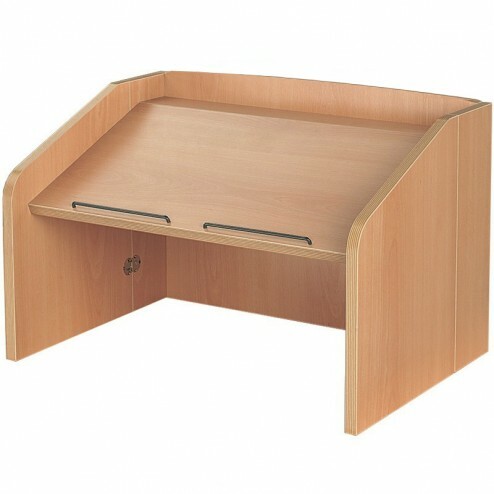 Our laminate folding desktop lectern looks like a classic counter top lectern, however this particular product has the ability to fold quickly and easily - making it extremely portable. It features a large angled shelf for you to place speech materials, along with a lip to prevent materials slipping during your speech. It folds flat for transport and storage, offering a great deal of convenience if you travel frequently in order to make after dinner speeches. When you order your counter top laminate folding desktop lectern you are getting a fantastic portable presentation aid with a beech effect finish. 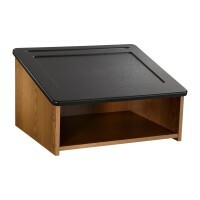 This product features tough ABS edging, adding to its durability. When folded, the desktop lectern measures 190mm – when erected it’s 500mm high, 620mm wide and 460mm deep. 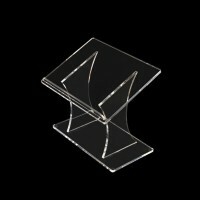 This folding lectern comes with a four to seven day delivery time, so be sure to place your order with us right away!